Research from Frost & Sullivan estimate that nearly 155 gigawatts of renewable energy capacity were installed globally in 2018. The year before, renewables accounted for close to 70% of total additions to global power capacity. The remarkable growth in the renewable energy market is due in large part to reduced costs of solar and wind power as well as increased incentivized and non-incentivized investments across sectors. Despite global factors that may contribute to stalls in global market growth — such as China’s decision to halt subsidies for utility-scale solar energy projects — increasing public support as well as improving economic conditions for generation and storage technologies are ensuring that 2019 is on track to see similar growth rates. On the horizon of the renewables industry are a number of innovative new storage solutions, including compressed air energy storage (CAES) systems. Compressed air energy storage technology, much like a pumped hydropower plant, works by heating and compressing ambient air to be stored under high pressure in aquifers or underground caverns. The air can then be decompressed and released to power a turbine-run generator, creating electricity. CAES systems are estimated to cost just a tenth of the average price of battery storage, according to the MIT Technology Review, and — since they allow a theoretically infinite number of charge and discharge cycles — offer a longer lifespan than battery systems, which demand periodic replacement. What’s more, new research out of the United Kingdom suggests that large-scale applications of underwater porous media compressed air systems (PM-CAES) could promise upwards of 60% net energy efficiency. An alternative to building large-scale CAES plants underwater or underground is constructing small-scale aboveground CAES systems using man-made vessels to pressurize the air. The draw of small-scale compressed air energy storage is the geographical flexibility it allows. These systems, like chemical batteries, can be installed almost anywhere by independent firms or small businesses. What’s more, these systems can be grid-connected or operate off-the-grid, in tandem with or apart from additional battery systems. Researchers propose further advantages of micro-CAES systems, including the fact that unlike larger systems, they do not require toxic or rare materials, making them safer and more readily viable. Smaller, free-standing vessels enable the creation of a decentralized network of storage systems that don’t require advanced production lines or the difficulties that come with installing and maintaining larger industrial systems. Another promising application of CAES systems is in the wind energy sector, where compressed air storage provides a critical advantage — overcoming the negative impacts of unfavorable environmental conditions on power generation. When conditions are not sufficiently windy, turbines cannot generate adequate electricity. CAES systems, however, surpass this hurdle since they guarantee long-term energy storage and can generate electricity in accordance with demand. 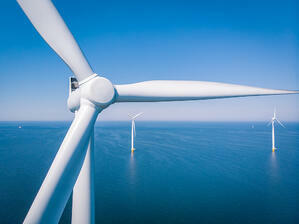 With CAES systems, renewable energy generated from offshore wind turbines, for example, could be used to power a motor that creates compressed air. Air would then be stored in porous subsea rockbed wells and released when needed to power turbines and generate electricity for the grid. Like wind, solar energy production suffers from an intermittency problem caused by unpredictable or undesirable environmental conditions. However, the long-term storage capabilities of CAES systems provide a foolproof solution. Power produced during sunny daylight hours can be repurposed to heat — and thus compress — air inside an airtight chamber. When a lack of sunshine prohibit generation, the compressed air can be released either through a turbine or through an alternate expansion device to create electricity. There remains untold potential for compressed air applications in the renewable energy industry. For instance, Hydrostar, a Canadian firm, is outlining plans to transform old fossil plants into zero-emissions compressed air-powered energy facilities. At the same time, research is being conducted on recovering micro-CAES systems’ thermal energy to be used in water or space heating applications. As it stands, CAES systems are not the most energy efficient or logistically effective solution to rise to the multifold challenges of securing a renewable energy future. Within the coming years, however, we’re likely to witness a surge of tech innovation that will position compressed air as a powerful tool in decarbonizing the world and creating a more sustainable future.